Categories > Card Magic > Has Anybody Made Their Own Cards? Has anyone ever tried making their own cards before? Maybe just some 1-offs for gaffs, etc? I just got an ebook from Chris Wasshuber called "How To Make Your Own Playing Cards." It's fascinating. He says that he uses a very specific coating fluid - the real stuff that he bought in bulk from a card manufacturer. He sells small bottles on Lybrary.com, but says the supplies may run out soon if they aren't already gone. So my question is - has anyone used ANY of these coatings before? If so, what were your results? The reason I'm looking into doing any of this is that I want to try to make a playable/fan-able/shuffle-able deck of cards that replicates an authentic medieval period (pre-1600) deck, like the Rouen deck (1567). The only ones you can buy online (I have a recent separate thread on this :-)) are not really made for handling like we would. They're just printed on card stock and cannot be fanned, run, riffle shuffled, etc. So I'm looking into the possibility of making some of my own. I tried making some one off gaffs at one point (special pictures on) following some instructions from a book. I didn't think the end result was good enough so not tried since. Thanks Paul. Did you try to put any coating on it? I did but don't recall what it was, it's over 10 years ago. Last time I wanted a special card I got it done by uploading a Jpg to Print By Design in England. As an update to this, I just went ahead and purchased the coating that Chris sells on Lybrary.com. I'll report back on how well this works! Hope you are well. I looked at your other thread but don't think I saw these listed. Apologies if you've already reviewed as a potential. Thanks Eric. Wow! I love that video. I actually didn't know the part about the jack of hearts design being lost form the original deck. Interesting. I wish I had that guy's artistic ability. I'm super curious about this deck. But I can't find any information about it! the picture shows the case, which has a card back design that is most definitely not authentic, since there WAS no design on the backs of cards until after 1600 - certainly not on the Rouen deck. I wrote to them, asking if there was a way to take a look at the individual cards. Hopefully they will write back. This is an amazing find though. Thanks so much!! I can't believe that with all the searching (using terms like "historical playing cards," "medieval playing cards," etc.) that I never found this site! My Google foo is not strong :-). Gah!! I found a review of the deck on YouTube and I can't believe he put indices - huge ones - on these cards! And they do have back designs. Sigh. Looks like I'm going to need to make my own after all. Is Cards from Martin still around? Years ago he made excellent gimmick cards, could make just about anything you wanted. No idea. Never heard of him. But even so, the obvious issue is cost. If I want a full deck of custom cards (which is looking like the only way to get what I want), someone will need to do set it up and do the run. And just THAT is going to cost hundreds (if not more) or dollars. USPCC will do it, but you have to buy 1,000 decks! Since I just want to make a few decks, I think doing it myself would be most cost-effective thing to do. If it works, I can "maybe" make some decks to sell. But I'd never be able to unload 1,000 decks. I'll report back after my card-making experiments. I don't know if you're aware of Make Playing cards...https://www.makeplayingcards.com/, but they may be able to help you. Ken, have you talked to the Card Shark? Originally Posted by Eddie H.
Thanks Eddie. Going to check them out now. Well, I have his "Heirloom Deck," which is really VERY close to what I want. Despite it not being actually authentic to pre-1600 period, it has a plain back design that doesn't scream "modern!" and the indices are so small as to be barely noticeable. The problem with them is that they don't handle well - can't fan them and running single cards is very difficult. I'm going to try applying the coating to them when I get it (the "real" stuff from Chris at Lybrary.com) and see if that helps. I don't know for sure, but it seems likely that any custom decks I get from him would be similar? I love the Phoenix decks. But the Heirloon deck is NOT like them. I suggested Card Shark because he can print something for you. You can design a deck and have it printed by him. The link I posted is for the page where he tells you about his custom decks. Talk to him and you will see if he can help you. Thanks Paul - The design is the most important thing. So though these look aged/used, the design is still very modern. I appreciate the tip though! Thanks. Neil Lester (Cards by Martin) passed quite a while ago. One guy to try is cardmaker from Germany, he did a great job on some custom cards for me a while ago. https://plus.google.com/+CardMakerBerndMauckschGermany is his address. If you click on his name in the header it gives you contact info. Also Marty Martini and Gary Plants have instructional videos on making cards. I think just like you will be acting the part of a medieval performer, some of these aged looking cards can act the part of the real thing. Most people aren't seeing them close up, and the index corner numbers whilst not authentic actually aids someone recognizing the card and remembering it. For the quality of card handling it's probably an acceptable compromise rather than the great expense of getting your own decks made. FWIW, I agree with Paul. The required expenses, in both time and money, to custom make cards will far exceed your audience's experience. I think this is a case of close enough is good enough. Or even better. If it were me I would write some jokes to explain the use of modern cards. "I'm using Bicycle brand playing cards because the Time Machine TSA confiscates cards, codpieces, and merkins." 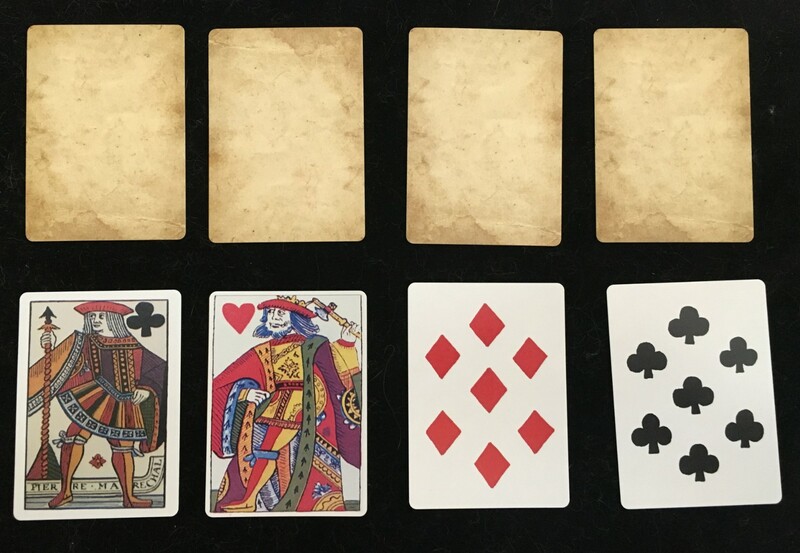 Or, "This deck is from 2018, but it occupies the same relative space as a deck from 1559." Just my opinion. Regardless of what you end up doing, good luck and enjoy! If it were a matter of performing at a Ren Faire or something like that, I would totally agree with you. But in my group - The Society for Creative Anachronism (SCA) - there are multiple levels of "care" about authenticity. Has anyone complained that I'm using modern decks? No. And if it were JUST a matter of me wanting to perform to entertain, I could continue to do that. But many SCA people appreciate an added push for authenticity. In fact, when I take my performances into the realm of the "Arts and Sciences" world, authenticity is key. And I would like to take my magic into the A&S competitions and displays in addition to the market busking (where it doesn't matter nearly as much). So much of this is me wanting to display period props (as period as possible) and do period magic (focusing on cups & balls, ropes, cards and coins) - showing people what was truly done in period (pre-1600). Long way to go to say "it's me wanting to do this." I don't know if you're aware of Make Playing cards... https://www.makeplayingcards.com but they may be able to help you. Ken, I'd second this recommendation of Make Playing Cards. MakePlayingCards.com is a good compromise. The card quality isn't quite as good as USPCC, but the quality is much higher than what you'd get with printing companies like Artscow. The cards are embossed, handle and shuffle reasonably well, and are also durable. They also let you print small sized orders, including just a single deck. My son has used MPC to print several decks for himself, and has been quite pleased with the results. I also know quite a few publishers of custom decks will use MPC for printing sample prototype decks before going ahead with a larger order with USPCC or LPCC/EPCC. If you are looking to make your own deck in a print run with a low number of decks, I think you'll find it's easily your best option. Thanks everyone! I'm working with MPC as we speak. I'll let folks know how it went. Having troubel getting images uploaded at the moment. But I'm sure we'll get that sorted. Here's an update. The site Make Playing Cards is incredible! Eddie H, THANK YOU for sending me that way. I created images in Photoshop after taking pictures of the replica deck (on paper card stock) I had. THAT took awhile. But once I was done with that, I uploaded each one to MPC. Then since medieval cards had no design on the back, I just used an image of aged parchment to sort of duplicate a very used set of cards for the back design. What I got back was a deck (you can order a SINGLE deck for like $20 after shipping) that feels and plays like a modern deck. The only issue (which is really no big deal unless I'm trying to enter an arts contest for authenticity) is the round corners of the deck. Medieval cards were still squared off at the corners. But still, this is pretty much EXACTLY what I was looking for. Thanks again, Eddie, for the tip! That looks terrific Ken - glad to hear they turned out well!